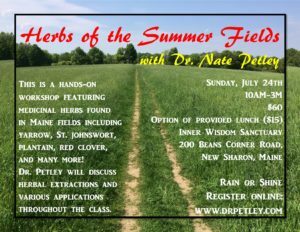 Learn about useful herbs growing in fields throughout the summer months in Maine with Dr. Nate Petley, naturopathic doctor and clinical herbalist. Dr. Petley will discuss herbal extractions and various applications throughout the class while introducing herbs growing at Inner Wisdom Sanctuary, focusing on those that are ready to harvest. He will discuss plant identification, harvesting techniques, usage, and contraindications. Some of the featured medicinal herbs include yarrow, St. johnswort, plantain, red clover, and many more!